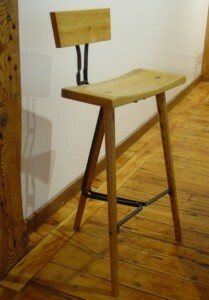 Much of the furniture made by Rising Sun Forge is made in collaboration with Tom Kuklinski of Kuklinski Woodworking. We have been working together for more than 20 years. Our early pieces primarily involved forging iron details applied to wood furniture, our more recent work has evolved into pieces that are evenly balanced between forged steel and woodwork. Each piece involves a fair amount of back and forth discussion around design details. One of the beauties of a good collaborative process is having another set of trusted eyes seeing the work from a fresh perspective leading to a more fully refined design.